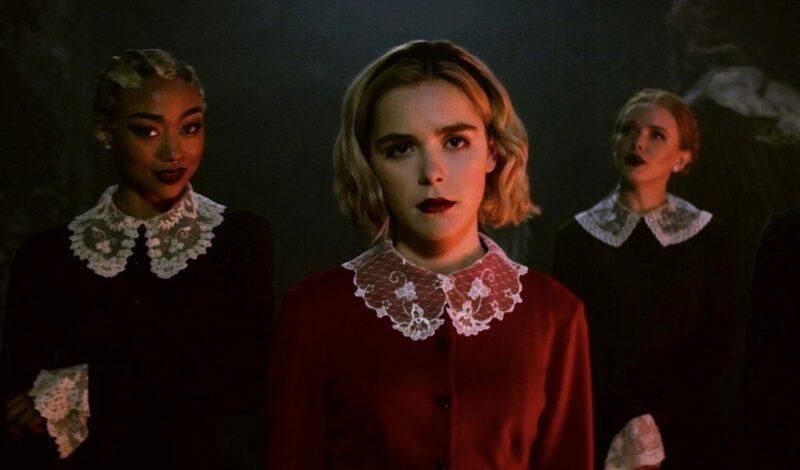 The worlds of Riverdale and The Chilling Adventures of Sabrina haven’t explicitly collided (yet), but a small cameo in the first season of Sabrina just brought them one step closer. While the two share a comic universe and an executive producer in Roberto Aguirre-Sacasa, it seems a crossover event isn’t quite a done deal. However, Aguirre-Sacasa was able to smuggle one very subtle reference into his new Netflix series. As many Riverdale fans surely know, the neighboring town of Greendale—aka where Sabrina lives—has been mentioned several times in the CW series. And Sabrina returned the favor, name-dropping Archie’s crime-ridden hometown several times in its debut season. And the new Netflix series took it even further, slipping a newly-deceased Riverdale character in for a cameo. If the teen delivering Mrs. Wardwell’s Thanksgiving dinner in the seventh episode of Sabrina looked familiar, it’s because it was Ben Button, the Gryphons & Gargoyles player who we can only presume dead after he jumped out of a window at Riverdale General Hospital following a poisoning ritual he narrowly survived. Riverdale fans may be doing a double take from watching a character we just saw die a few weeks ago pop up in Sabrina with a pizza in hand, but Aguirre-Sacasa doesn’t want us to dwell on it too much. "It suggests a very deep, deep mythology where time and space bends. I love that kid. I’m sad that he keeps turning up and horrible things keep happening to him," he cryptically told Entertainment Tonight, regarding Ben's appearance. "It seemed like it was pretty final, but yet there he is in Greendale. But in Greendale, everyone pops up—the dead don’t stay dead long in Greendale." Wait, does that mean Ben cheated death twice? If that’s the case, he should be the one crowned Gargoyle King. Furthermore, wasn’t one of the major lessons in Sabrina that one shouldn’t just try to resurrect the dead? Despite his apparent death, it does kind of make sense that Ben Button was chosen for a Sabrina cameo. In Riverdale, he’s not only known to randomly pop up when the plot calls for it, but he’s also set foot in Greendale before. Back in the Season 2 premiere of the CW series, he was seen at Miss Grundy’s new home in Greendale…moments before her murder. Be on the lookout for Ben while watching Season 1 of Chilling Adventures of Sabrina, which is streaming on Netflix now.